Growing raspberries in the backyard will produce a bountiful supply of raspberries once or twice each summer. Summer-bearing raspberries produce once in the early summer and ever-bearing raspberries produce in early summer and again in autumn. Plant raspberry bushes in early spring and allow two years after planting for the plants to establish. Soon you will enjoy a crop of wonderful raspberries. Choose a growing location that receives 6 to 8 hours of direct sun daily. 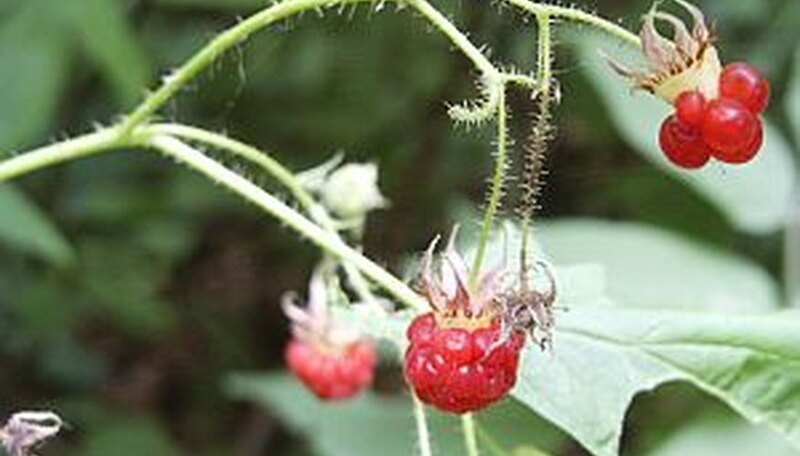 Do not plant raspberries near wild raspberries or blackberries. Do not plant raspberries in a location that previously grew potatoes, tomatoes or eggplants because organisms may be in the soil that could impede growth. Work the soil to prepare for the raspberries. Add a 1-inch layer of compost to the soil and work it in well to improve quality and drainage. Raspberries will successfully grow in almost any soil. Create raised rows that are 10 feet apart. Make the rows approximately 6 inches high for proper drainage. The spacing of the raspberries along the rows varies with the type of berry. Space red raspberries 2 feet apart, black raspberries 2-1/2 feet apart, purple raspberries 3 feet apart and thornless raspberries 6 feet apart. With a trowel, dig holes that are about 6 inches deep for each seedling. Place the seedlings so they are approximately 2 inches deeper than they were in the temporary pots, and fill in with soil around the roots. Immediately after planting, water the raspberries generously and ensure that the newly planted seedlings receive 1-1/2 inches of water each week while they are establishing. Mulch around the base of the plants with sawdust or straw to help control weeds and keep the soil moist. Watch for weeds and remove them. Fertilize the new raspberry plants 10 days and 40 days after setting in the ground. Use 1 pound of fertilizer for each 100 feet of raspberry row. In subsequent years, fertilize raspberries in the early spring and again before they bear fruit in early summer. Some raspberry plants need growing support. Consider erecting a simple trellis by installing a stake at both ends of each row and stringing heavy twine tightly between each stake along the growing raspberries. Loosely tie the raspberries to the twine for support.